"Ben Gage MCing The Joan Davis Show"
The Hollywood radio industry provided steady work for a number of movie players when there was no movie work to be had. It was also a refuge for a number of unsavory characters, the sort of people who give show business a sometimes less than stellar morale reputation. Ben Gage was an athletic, tall, good looking fellow from Chicago with a better than average singing and speaking voice, but he wasn’t quite leading man material. There were plenty of actors who had whatever it took to get a job in front of the camera but could not sing, so Gage found occasional work dubbing the voices of non-singing actors, including Victor Mature, Cornel Wilde and George Montgomery. He also worked on radio as an announcer. 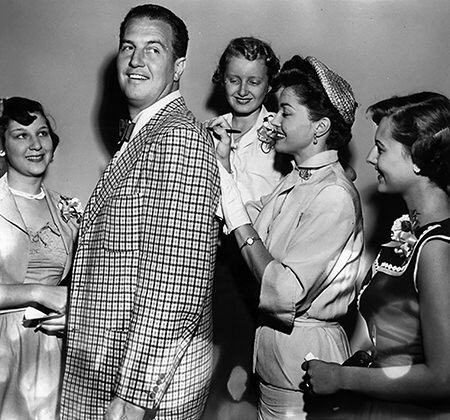 He was on the Red Network, occasionally joining Bob Hope’s company on the road as announcer for The Pepsodent Show in the months before Pearl Harbor, and occasionally in 1942. Ben served with the Air Forces during the war. While attending a fundraiser, 6’6” Staff Sergeant Ben Gage caught the eye of swimming star Esther Williams, and he asked her to dance. The couple began dating about the time her first divorce was finalized, and were married on November 25, 1945, in Beverly Hills. They honeymooned in Acapulco where the bride was filming Fiesta (1947). While the film was being shot, Ben was arrested for fighting with an employee at the hotel where the cast and crew were staying, much to the delight of gossip columnist Hedda Hopper. Ms. Williams related that "Ben was into fun. He was boyish, almost puppylike, and that was exactly what I needed after all of Leonard's darkness", referring to her first husband, physician Leonard Kovner. The episode with the Mexican police would be a harbinger of things to come. Gage fathered all three of Esther’s children, but she soon came to realize that he was “an alcoholic parasite” who was very happy to live off his wife’s fortune. 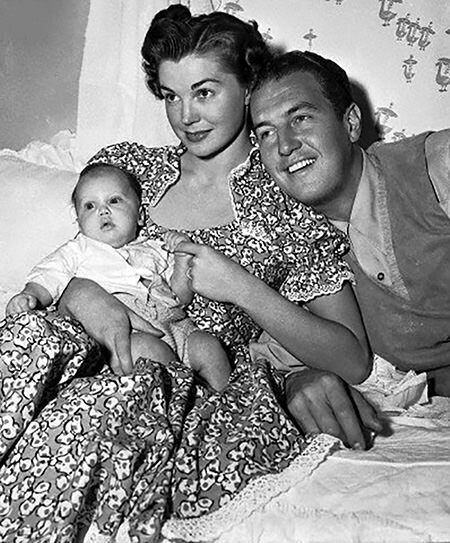 While the couple was in Hawaii where Esther was filming Pagan Love Song (1950), she discovered that she was pregnant with her third child. She needed to discreetly inform the studio in California of her condition, and Ben had met a man at the hotel who had a ham radio outfit. He convinced the radio operator to transmit the information without realizing that anyone who was listening to their radio at the time could hear the conversation. Esther’s private news was spread up and down the West Coast within hours. 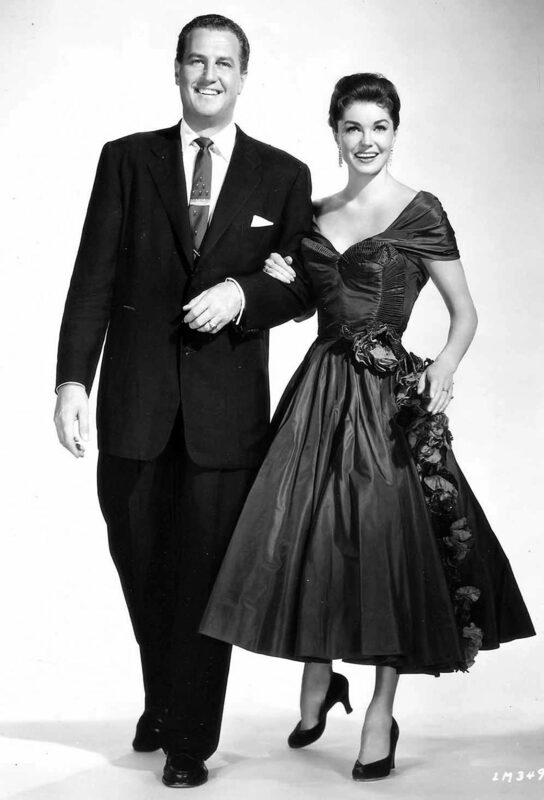 Ben was the announcer for an episode of Command Performance in 1947 on which his wife was a featured performer, and they were interviewed on Bud’s Bandwagon in 1952. Be the first to comment on "Ben Gage"